Oh my gosh, here it is: the last one, Number 30! Someone who does her best and does the right thing… because it’s the RIGHT thing, even when nobody is looking. There. That’s 30 things in black and white on your screen. It was a good exercise for me, and for many of you who faithfully responded to just about every post, I thank you! I probably shared more than I would have without the 30 Things prompts, but that’s alright. It was fun, made me think, and helped create a conversation between us. 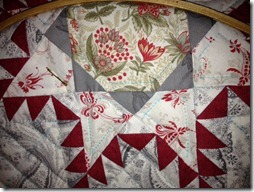 Nicely done–the questions AND the quilt! !